Ald. 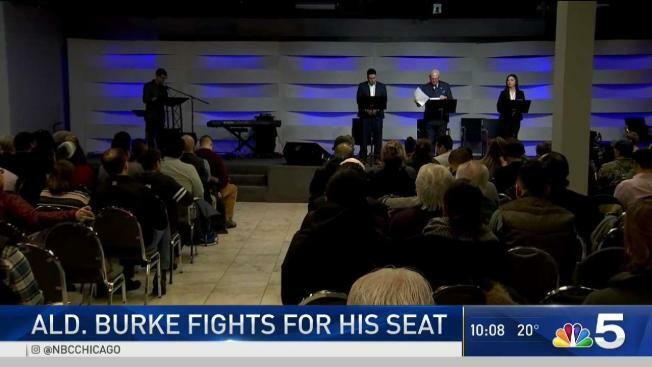 Ed Burke made a high-profile appearance Wednesday at a candidate forum in his ward. It came amid reports that a City Council colleague--Ald. Danny Solis--wore a wire for the feds during the investigation. Burke side-stepped the report and refused to answer reporter questions. Instead, he focused on re-election. At the candidate forum the longest-serving alderman in Chicago found himself in unfamiliar territory--fighting for his seat. "It’s also quite telling about what Mr. Solis did or didn’t do," 14th Ward candidate Jaime Guzman said. "I mean how often are we not hearing about the latest alderman to be indicted." NBC 5 learned Solis’ cooperation with the feds was brought about by the fact that Solis himself was the subject of a criminal probe dating back to 2014. Burke found himself on defense as challengers Guzman and Maria Patino zoned in on his mounting legal troubles. "I think he definitely needs to resign already and withdraw with from his candidacy," Patino said. Earlier this month Burke was charged by the U.S. Attorney’s Office with one count of attempted extortion. Applause broke out when Burke said once again that he’s done nothing illegal. "Goodnight ladies and gentlemen," he said. But he refused to talk specifics and instead was whisked out by security immediately after the forum. Solis did not show up for Wednesday's City Council meeting and has not responded to repeated requests for comment.